Cutaneous angiosarcoma accounts for 1% of all soft tissue sarcomas. Approximately 50% of angiosarcomas occur in the head and neck. Angiosarcoma tends to be aggressive and multicentric and has a reported 5-year survival rate of around 20%. Surgical excision combined with radiotherapy is the best treatment option. Nevertheless most patients do not undergo surgical treatment due to their poor general condition and delay in diagnosis. 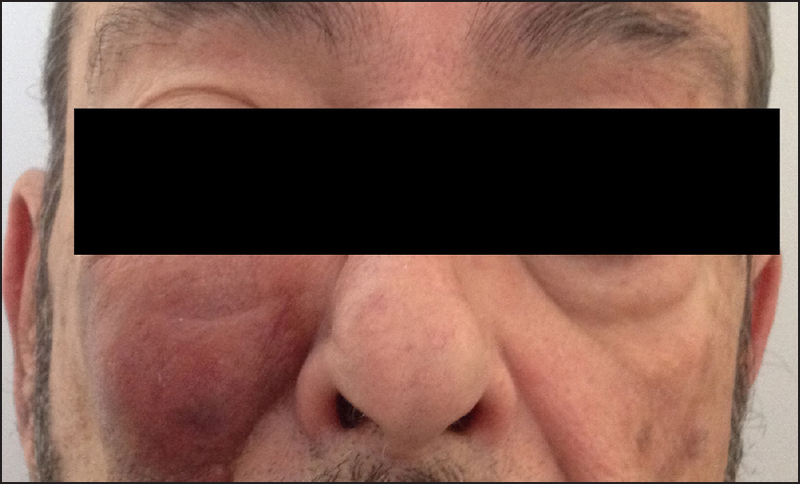 We present a clinical case of successful surgical management of infraorbital cutaneous angiosarcoma. 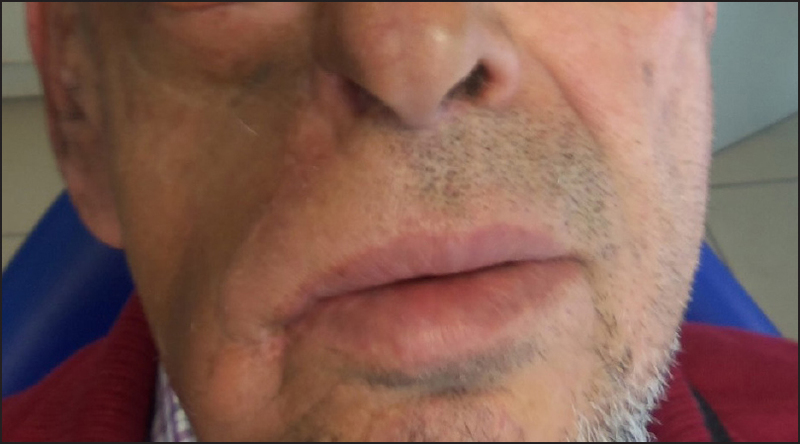 A 67 year old man was referred to our department for evaluation of a fast growing lesion on the cheek. On examination the lesion appeared as a dark bluish nodule 3 × 3 centimetres in diameter that occupied the entire right infraorbital region [Figure 1]. On magnetic resonance a highly vascularized soft tissue tumour in the infraorbital region was detected. Urgent incisional biopsy in the nasolabial groove was performed and reported as an angiosarcoma. Three weeks passed between primary evaluation of the patient and the definitive diagnosis of right infraorbital angiosarcoma. A significant tumour growth was observed in this lapse of time [Figure 2]. The surgical treatment was programmed and the tumour was excised with surgical margins of 1 cm beyond the clinical margins. The resultant defect of 7 × 5 centimetres involved soft tissues of the cheek, lateral side of the nasal region and infraorbital region. The inferior eyelid of the right eye was preserved. The frontonasal suture and malar bone were practically degloved. Cervicofacial advancement flap was raised in order to reconstruct the defect. The Mitek anchorage system was applied in order to attach the flap to the bone: two Mitek anchors were placed in external canthal region and in frontonasal suture [Figure 3] and [Figure 4]. The patient did not present any complications in the postoperative period. 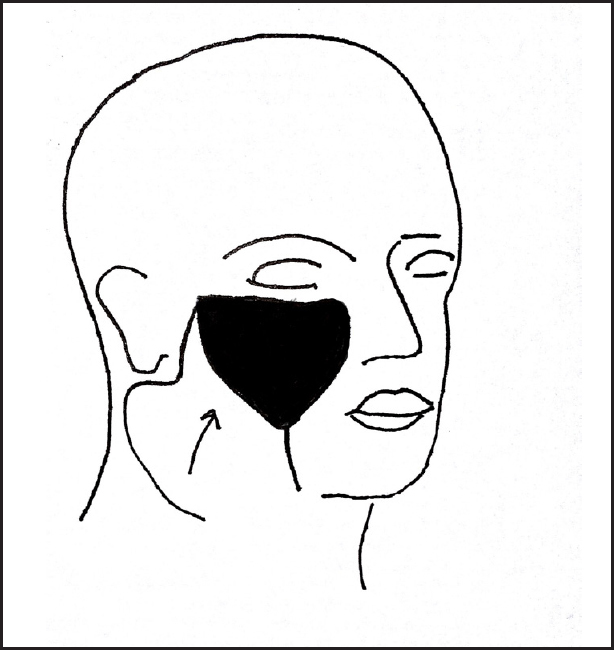 The cervicofacial flap remained in a stable position [Figure 5]. The inferior eyelid position did not alter and no ectropion was observed. Slight contour deformity was observed in the infraorbital region due to the lack of volume provided by cervicofacial advancement flap. Histopathology of the specimen showed clear margins and he was given radiotherapy. The possible options of management of angiosarcoma are surgical excision, radiotherapy, chemotherapy and recently vascular-targeted therapies. Wide surgical excision is advised whenever the tumour stage and general condition of the patient allow. Multiple excisions can be required due to invasive multifocal growth. In cases of head and neck localization of angiosarcoma wide excision is challenging due to aesthetic and functional considerations. This limitation to radical surgical excision can explain the fact that survival rates in head and neck angiosarcomas are lower than in angiosarcomas of extremities. 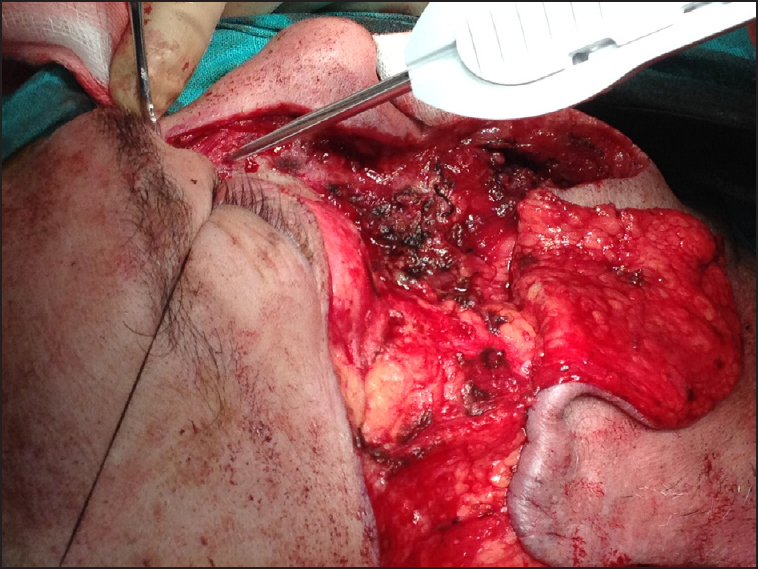 The post resection defects are considered to be best covered with split-skin grafts and not complex flaps or grafts. Coverage should first be performed when the final histopathology report is available. In this case a wide surgical excision was performed and immediate cervicofacial advancement flap was raised in order to cover the defect. We consider that coverage of surgical defects in head and neck should be performed immediately as it can restore function allowing radiotherapy to begin faster (in our case the coverage of defect and prevention of ectropion prevented ocular complications in the patient). Mitek anchorage system was applied in combination with cervicofacial advancement flap as a reconstructive strategy. Anchors are devices made of biocompatible metal alloys, with the main function being that of uniting soft tissues over bony structures. 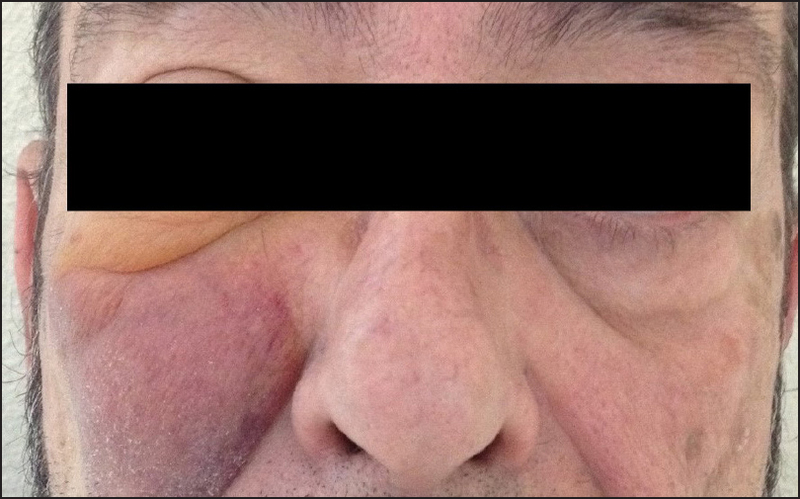 Suspension of the soft tissue flap in the infraorbital region is important in order to reduce the risk of ectropion or compromise of eyelid competency. Angiosarcoma presents high level of local recurrence after only surgical treatment (32.5%) with local relapse rate after a median-free interval of 5 months. Adjuvant radiotherapy is applied in cases of narrow or affected margins. Lewis CJ, Gerrand C, Barnes DE, Murray S, Milner RH, Ragbir M. Experience of angiosarcoma in the North of England Bone and Soft Tissue Tumour Service. J Plast Reconstr Aesthet Surg 2011;64:884-91. Khodayari A, Khojasteh A. Mandibular pathologic fracture as a first sign of disseminated angiosarcoma: A case report and review of literatures. Oral Oncol Extra 2005;41:178-82. Köhler HF, Neves RI, Brechtbühl ER, Mattos Granja NV, Ikeda MK, Kowalski LP. Cutaneous angiosarcoma of the head and neck: Report of 23 cases from a single institution. Otolaryng Head Neck 2008;139:519-24. Yang XJ, Zheng JW, Zhou Q, Ye WM, Wang YA, Zhu HG, et al. Angiosarcomas of the head and neck: A clinico-immunohistochemical study of 8 consecutive patients. Int J Oral Maxillofac Surg 2010;39:568-72. Shand JM, Beatty R, Tankersley KL, Costello BJ. Mitek anchors in facial Injury: An approach for soft tissue flap fixation. J Oral Maxillofac Surg 2004;62:619-21.